At Thanksgiving I always consider the first feast on the sandy shores of Massachusetts. Plymouth is so sandy it would have been difficult for settlers using European methods to coax much sustenance from the ground without the horticultural aid of the natives. The settlers had much for which to be grateful. The natives hadn’t bashed their heads in, had actually befriended them. 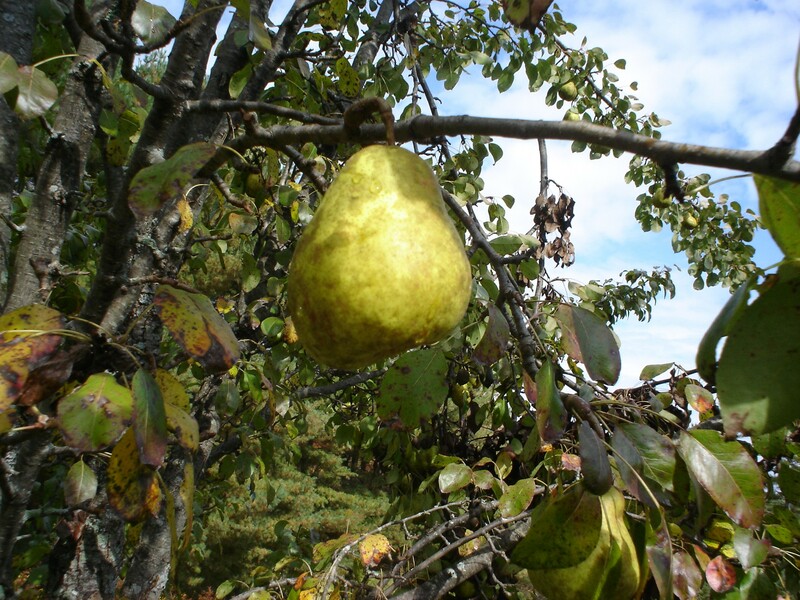 A few did not starve to death or succumb to disease during the first miserable winter. They could pray the way they wished there among the dunes with no one to disparage or condemn their beliefs. And they had some pretty radical ideas. I imagine the natives approaching the strangers warily, but drawn to the feast and the benefits of sociability. Little did they suspect the flood tide of invasion soon to occur, the destruction of their way of life and their very lives. Today’s celebration little resembles the first lengthy event, although women usually do most of the work, as back then. I have often wondered if we need this over-blown holiday with its rush of travel and glut of overindulgence. Yet, no matter how much football and balloon float parades and Black Friday try to take over the day, for a brief time all Americans are reminded that survival is an occasion for celebration. Every moment we live truly is a gift and we should be thankful, even if just once in the year. This entry was posted on November 28, 2013, in Uncategorized. 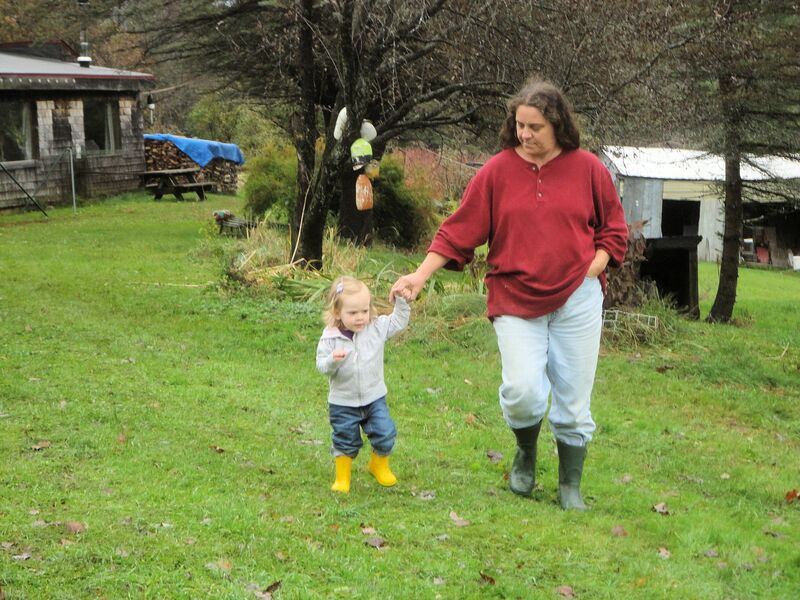 My grandaughter Lia is twenty months old and already a little farm hand. She loves to be outside and looking at animals. And her animal sounds are excellent, she can even do a horse really well. Last night was her first sleep over so her parents could go to an out-of-town show. I was a bit trepadatious, since she is still nursing at night and Gramma doesn’t have what it takes in that department. But she was perfect. She played hard all afternoon, got very tired, had a warm bottle of milk before bed and slept like a log. Today she was up at seven and ready for another fun-filled day. What a great little kid she is! 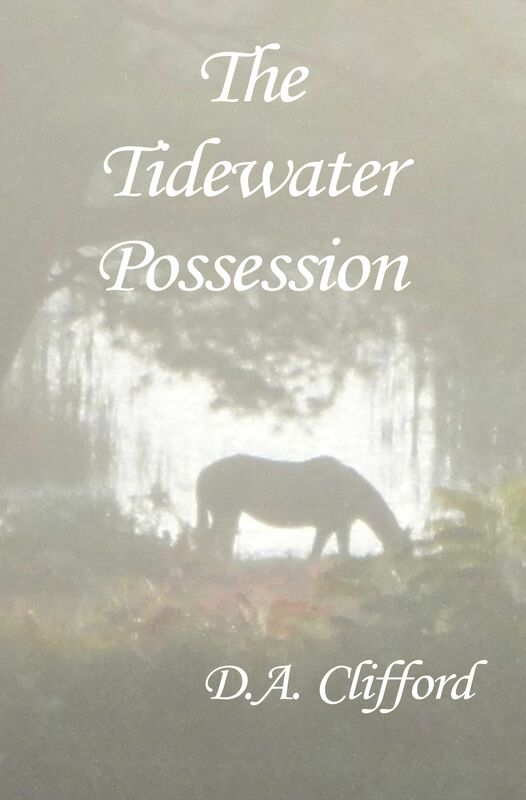 Into day three of my free Kindle ebook promotion, Nov 18-20, I have given away more than two hundred electronic copies of The Tidewater Possession. Some have even gone to other countries: the UK, Germany, Canada and Italy! I am hoping to give some books to Australia before the end of the day. It’s very exciting to have so many people reading my book! My work had so far been very personal, shared only with family and friends. Launching into the public arena is exhilarating and a bit frightening. Will people like it? This entry was posted on November 20, 2013, in Books, Uncategorized. The Tidewater Possession, set in Virginia of 1795, tells a tale of greed, callousness and vengeance. “Parlen jogged his mount into the yard of the old Browne farm. He slid from the saddle, tied the bay, then stared at his purchase. An oppressive air of vacancy permeated the old stone buildings. All was silent. Not a breeze wafted or insect stirred. No bird call broke the quiet. Hollow, dark windows gaped at him. The horse shook his head. Parlen’s heart jumped at the abrupt, loud jangle of bridle hardware. He gave a low laugh. What a weak fool. He strode to the cottage door, and pushed lightly on the weathered wood. The door didn’t move. Irritated, he thrust his shoulder against the planks. The door flung back and slammed the wall. Echoes resonated from the shadowed depths of the house. He hesitated in the doorway, suddenly reluctant to step inside. The echoes died. All was still. “Foolish,” he said aloud, and was comforted by the sound of his voice. His skin prickled. His instincts screamed—flee, go! What did he fear? Bravery on the battlefield had won advancement to officer. Colonel Parlen never backed from a challenge and he certainly didn’t turn tail and run. He stiffened his spine and entered the kitchen. A curious sound like a silver door chime tinkled in the air around his ears. He froze. Only his eyes moved as he searched the gloomy reaches of the room, trying to locate a bell, an explanation for the metallic peal. Leaves rustled in the yard behind him. A draft gusted through the door and slithered around his body. The cold air carried a fetid tang of rotting meat. Chill dug through his fine linen overcoat, his layers of clothing, his flesh. A frozen hand grasped his heart and squeezed the quivering rhythm to a stop. Parlen couldn’t breathe or move a muscle. Suspended paralyzed, an eternity passed in seconds before the painful pressure released. He staggered against the wall, gasping for air. A cold burn lingered in his chest. Also available on Amazon: Sin of the Father, the sequel and final book in the Tidewater Possession series. 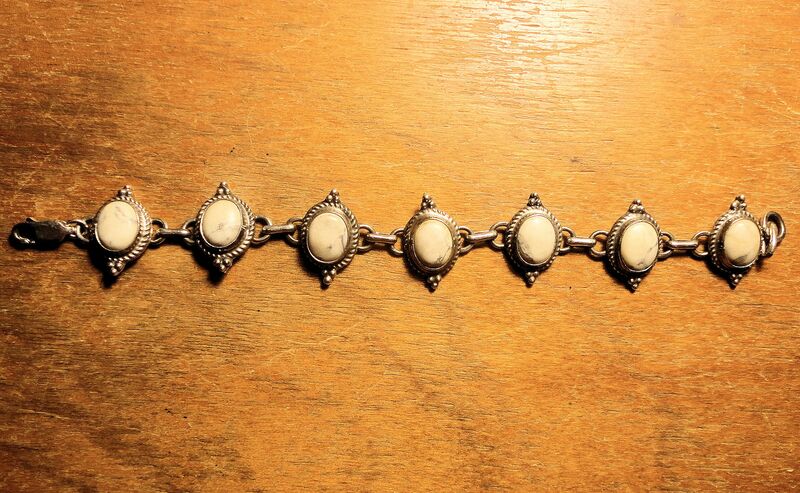 Jewelry made by native peoples of the Southwestern US is a particular passion of mine. I have a collection of more than 25 rings in sterling silver and turquoise representative of many different styles created by various artists from several different nations working with gems from mines in the Southwest. I prefer vintage jewelry and prize pieces that have been marked by the artist. Imagine my surprise when I spotted this in a case at the local second-hand shop. The bracelet was mixed in with a tray of cheap costume and junk jewelry. The workmanship of the piece stood out. These photos were taken under a lamp with a yellowish cast to the light. The stones are more white. 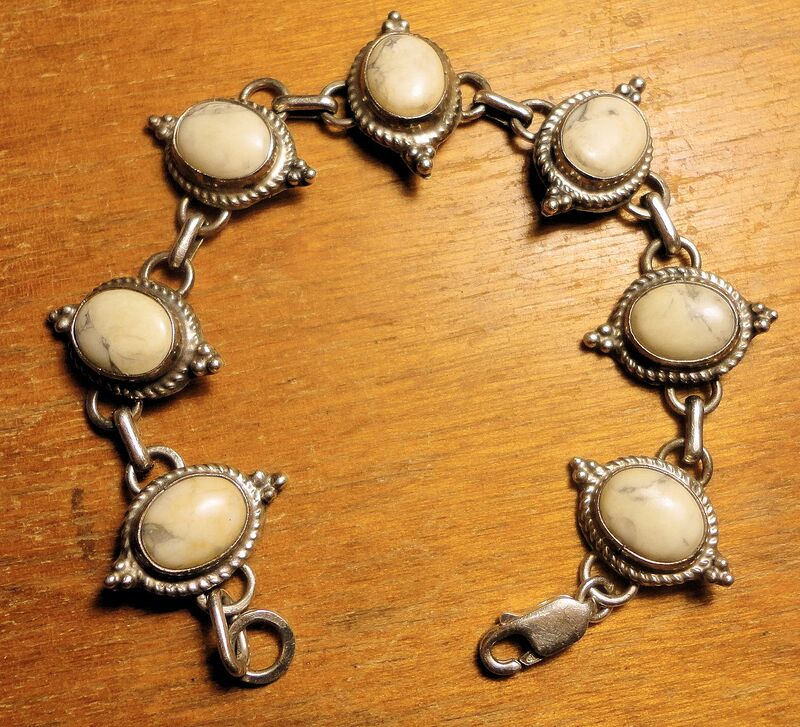 I believe this is howlite, though it could possibly be what is known as white turquoise. 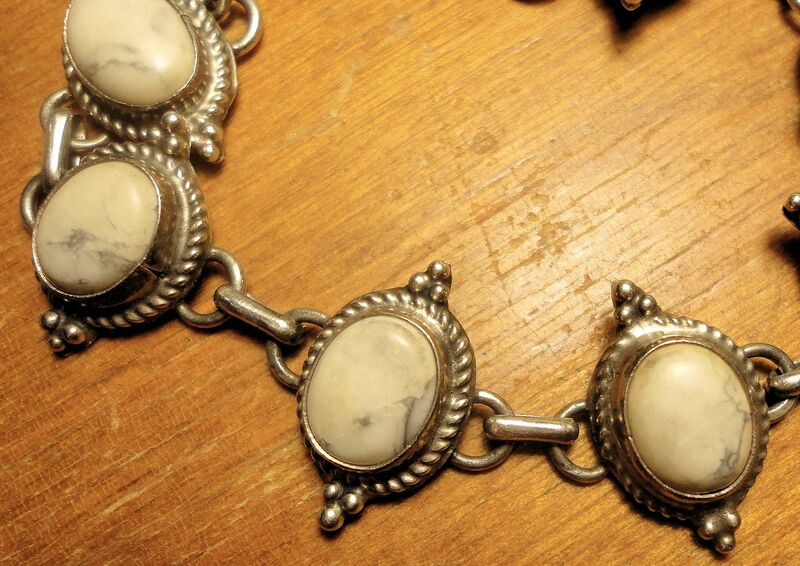 I am thinking howlite because the matrix is mostly a dark gray where white turquoise has a black matrix. These stone are unusual because the matrix has veins of what appears to be pyrite, and perhaps even some copper. 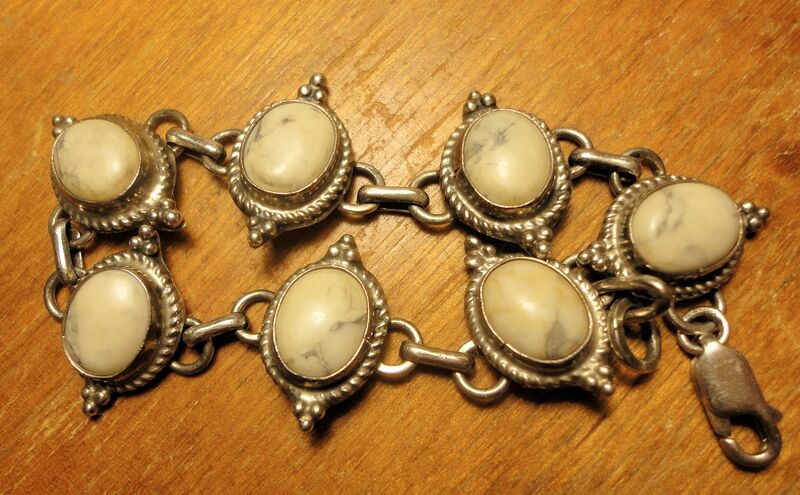 The clasp is marked 925–sterling silver and I am fairly sure the whole piece is sterling. 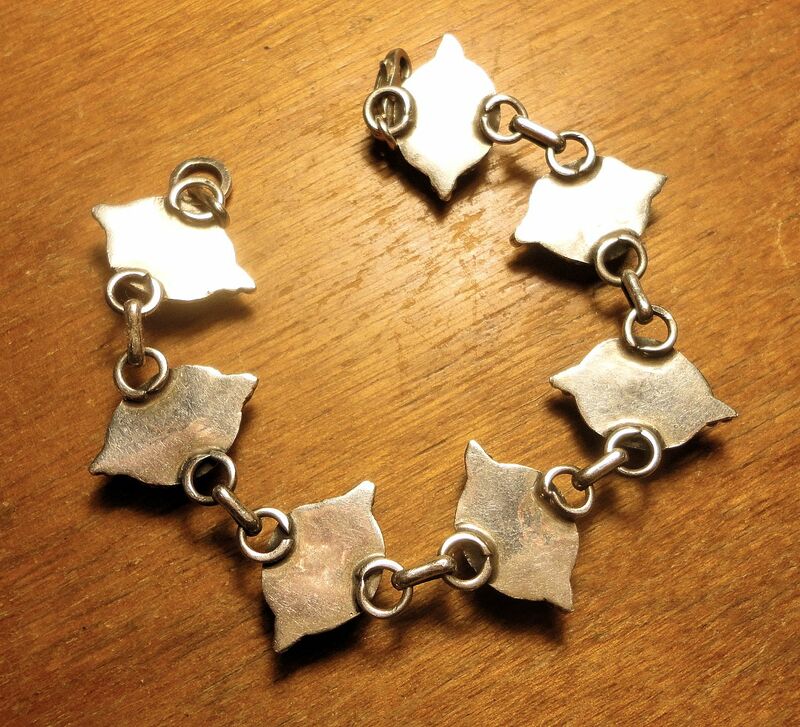 This bracelet has strong characteristics of native artist work. The links are hand soldered, the smooth bezel edges are somewhat irregular. This piece is handmade with care.I can find no maker’s mark, unfortunately. I paid $13 for the bracelet and would expect it to retail for $50-$75. However this is an early Christmas present for me. It will need to go to my local silversmith for a few extra links so it will fit. Merry Christmas to me! Here come the crows! Every morning and evening, large numbers of crows fly over our home. I have seen more than a hundred on occasion, flapping in groups or long bands. They are moving to or from the nearest major town, Waterville, where they spend the night. We are situated seven miles from town, and apparently, along a main crow flyway. As predictable as clockwork, the morning exodus from town brings the birds over us just about sunrise, or one-half hour after the skies lighten. So, it takes a crow approximately a half-hour to go seven miles–as the crow flies. 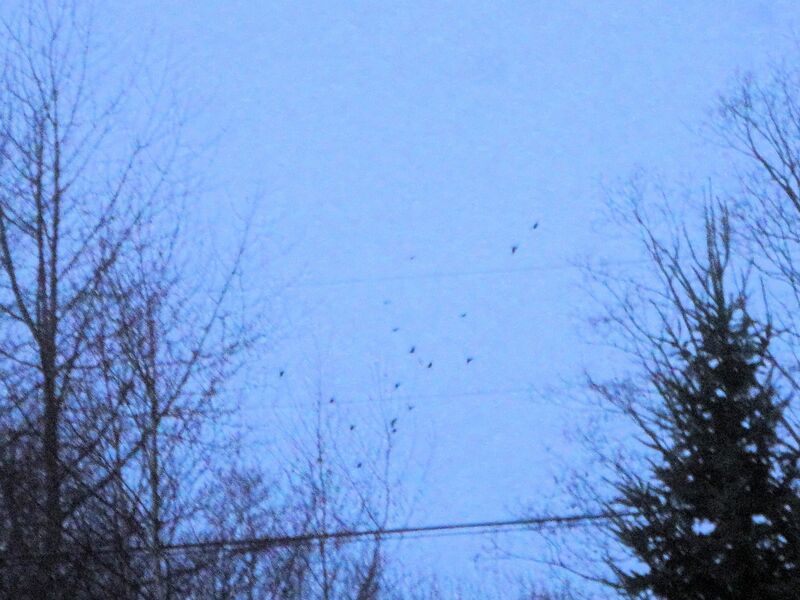 In the evening their numbers fill the air above us perhaps an hour before full dark. 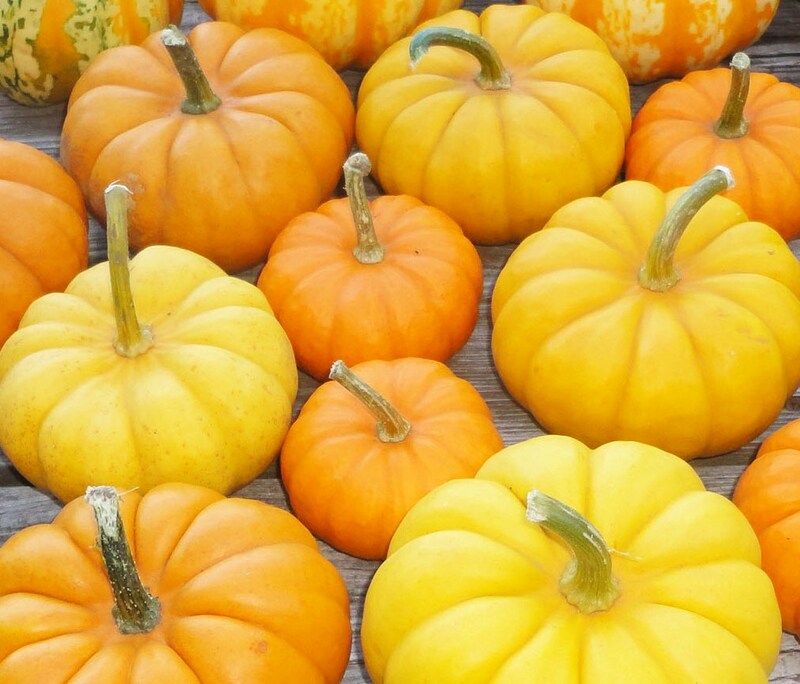 This phenomenon occurs every day, no matter the season. Our crows’ routines seem to vary from what researchers have discovered. The season makes little difference to their behavior. They fly to the warmer, lighted city to spend the night and spread out each morning to hunt and scavenge. I have seen their loud nightly urban gatherings in the tops of leafless oak trees in fall and dead tall trees during other seasons. Pity the poor home owners living near these congresses, they must get a rude awakening every pre-dawn. The crow’s call is one of the most piercing and far-carrying of birds. Among all animals, the crow’s intelligence stands out. Parts of their brains are as large, by body volume comparison, as our own. Corvus brachyrhynchos, the American crow, has the same smarts as any of its many relatives around the world. These crows have learned that intown is warmer than the country for sleeping purposes and the bright lighting used in cities provides a chance to spot the owls that prey on crows. Many towns have mature trees evenly spaced in large clearings (parking lots, lawns and parks,) providing great vantage points for vulnerable roosting crows to spot predators. Their brilliance and ability to survive on the foulest of carrion gives crows a distinct advantage. I suspect their species will continue to flourish long after we humans have brought about our extinction. Finding a new safe sleeping place will be a puzzle for them once the cities go dark. As they observe our destructive behavior from on high, I imagine the crows have already set their avian brains to the problem. This entry was posted on November 16, 2013, in Musings, Uncategorized, Wild Animals and tagged American crow, bird behavior, bird flocks, Crow, intelligent animals, roosting birds, rural life.